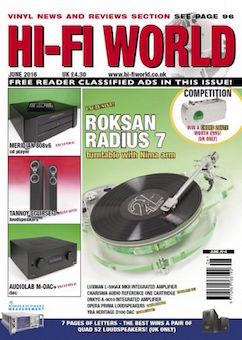 Splendid Luxman L-590AXII review in Hi-Fi World! Posted on May 17, 2016 by Philip O'Hanlon. Hi-Fi World has an excellent review of Luxman’s new flagship L-590AX MKII integrated amplifier in their June 2016 issue. The L-590AX MKII is essentially a more powerful version of the popular L-550AX (which won a 5 Globes Award from Hi-Fi World last year) and features many upgraded components. This entry was posted in Press and tagged Hi-Fi World, L-590AXII, Luxman, review.